Welcome to the website of the European Small Business Alliance. I am proud to announce that ESBA has been influencing European legislation for SMEs in a positive way for two decades! To mark this joyous occasion, we are organising a number of themed events throughout the year. Do come and join us there! Founded in 1998, the European Small Business Alliance (ESBA) is a non-party political group which represents small businesses and the self-employed at EU level. ESBA develops targeted lobby activities for member business groups. It is one of the largest organisations based on voluntary membership in Europe. Through its direct membership, associate membership and cooperation agreements, ESBA represents more than one million small businesses in 36 European countries. I am the Managing Director of an automotive supply chain manufacturing business based in the UK. I started my company in 1977 and employ 23 people. In June 2012 I was honoured to be elected to the challenging post of President of the Alliance. Many laws affecting the running of our businesses originate in Brussels. Small businesses face a plethora of EU rules on health and safety, employment, the environment, and the Single Market, this is why ESBA is based here in Brussels, the centre of EU law making. 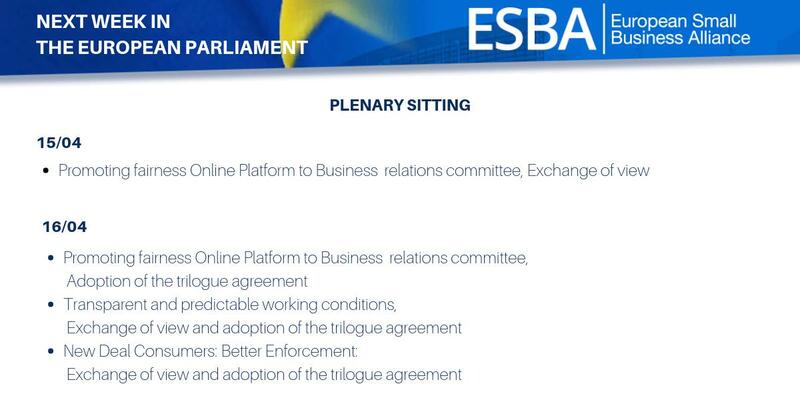 ESBA lobbies the EU institutions, doing everything possible to make sure that European legislation is not damaging small businesses, and to ensure that the small business perspective has been taken into account before proposals are signed into law. European policy makers are relying far more on the expert input of real small businesses. With a civil service that is no bigger than that of a large European city, it would be impossible for the European Commission to speak with each and every business individually. For this reason, the Commission is looking for a unified voice of small businesses. ESBA aims to be that voice, which is why we are involved in the decision-making process at the very early stages. The European Parliament as well relies heavily on external expertise, as its members often have to make decisions which do not necessarily meet their expertise. ESBA's role as the voice of micro and small businesses gives us the opportunity to make your concerns heard at the highest levels of policy making. Particularly since the introduction of the first Small Business Act for Europe, in 2008, there is a general consensus that SMEs are not the same as large companies and that a one-size-fits-all approach to legislation is no longer appropriate. However, there is still a large discrepancy within the SME spectrum. What is perfectly manageable for a company of 200 employees can be disproportionately burdensome or even detrimental to a micro business of 3 employees. Yet, both are categorised as SMEs and need to abide by the same rules and regulations. It is ESBA's mission to sensitise decision-makers to these differences and to advocate the need for a tailored approach for micro and small companies. Let us not forget that 92% of all European companies are micro! We welcome you to join our alliance today and make your voice heard in Europe!